Israel moved its troops into Gaza starting a ground offensive eight days after launching an airstrike campaign in efforts to end rocket attacks from Hamas militants. Israel’s defense minister, Ehud Barak, said in a statement broadcast on television: “This will not be short. This will not be easy. I do not wish to delude anyone,” adding that the coming days will be difficult for the residents of the south of Israel. “Our aim is to force Hamas to stop its hostile activity and to bring about a significant change,” Mr. Barak said. “We have carefully weighed our options,” he said, adding that “we have restrained ourselves for a long time but now we have to do what must be done” for peace and tranquillity. A spokeswoman for Israel Defense Forces, Maj. Avital Leibovich, said in an interview broadcast on CNN that troops were targeting areas responsible for the launching of rockets into Israel, as well as tunnels, bunkers, and training facilities — “everything that is affiliated with Hamas is a legitimate target,” Major Leibovich said. “We have many, many targets, and therefore to my estimate it’s going to be a lengthy operation,” she added, with specifying how long the ground war could last. Ms. Leibovich said the Israel Defense Forces were avoiding targeting civilians and were trying to give people leaflets and messages warning of the strikes. “Hamas is not putting any efforts to avoid targeting civilian deaths,” she said, referring to rockets launched by Hamas into Israel. Sources in Israel and Gaza tell us that Israeli troops and tanks are moving forward into Gaza. Hamas is returning fire “heavily” acording to sources on the ground. The Israeli government has confirmed that the attack on the ground has commenced. As many as 10,000 Israeli soldiers were believed to be around Gaza prior to the start of this operation. “We have many many targets,” Maj. Avital Leibovich told CNN. “To my estimation, it will be a lengthy operation.” She said the goal of the operation was to take over the areas used by militants to launch rockets against Israel. “The civilians are not our target, only militants, Hamas militants,” she said. Reacting to the incursion, chief negotiator for the Palestinian Authority Saeb Erakat said: “What this will do is undermine the peace process.” The Palestinian Authority is the government of President Mahmoud Abbas. We are adding to this report as we lean more…. 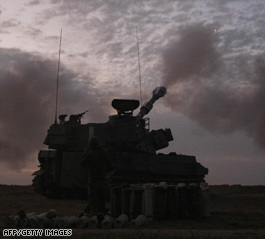 Above: Israeli tanks fire shells toward Gaza as evening falls Saturday. A small column of Israeli military vehicles, backed by attack helicopters, were seen crossing the border into the northern Gaza Strip on Saturday evening. A column of Israeli tanks, some firing their weapons, rolled into the northern Gaza Strip on Saturday, a Palestinian witness said, in what appeared to be the beginning of a ground offensive against Islamist Hamas. The witness, a resident of the Gaza town of Beit Lahiya, said the column crossed the boundary fence under darkness and was accompanied by Israeli combat helicopters. The witness could not immediately say how deep the Israelis had penetrated into Palestinian territory. Israeli media quoted unconfirmed witness reports suggesting there were incursions under way elsewhere in Gaza. For the first time since the start of Operation Cast Lead, the IDF sent a large number of ground troops into the Gaza Strip on Saturday evening. Several hours earlier, the army began to fire artillery shells into the northern part of the Strip. 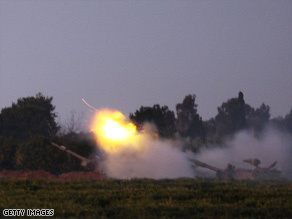 According to reports, the artillery units were attacking targets in northern Gaza from where Palestinian terrorists had been firing rockets at southern Israel. Warplanes, gunboats and artillery units blasted more than 40 Hamas targets throughout Saturday, including Hamas’s central intelligence headquarters in Sha’ati, weapons storage facilities, training centers and Hamas leaders’ homes. Air strikes that had waned during the day gathered pace after dark. One raid hit a mosque in the northern Gaza town of Beit Lahiya, killing 14 people and wounding 33, seven critically, according to a Palestinian health official. Other Palestinian reports claimed that the mosque was hit by an artillery shell. Israeli troops began moving into Gaza tonight, on the eighth day of their assault on the Hamas-ruled territory, Israel Defense Forces said. Earlier Saturday, the Israelis had begun using ground artillery in addition to the ongoing airstrikes in their assault against Gaza. Israel’s military says ground forces are crossing the Gaza border in an escalation of Israel‘s week-old offensive against the territory’s militant Hamas rulers. Israeli TV channels are broadcasting images of troops marching into Gaza after nightfall. The military confirmed a ground operation was under way. Defense officials say around 10,000 soldiers have massed along the border in recent days. THIS IS A BREAKING NEWS UPDATE. Check back soon for further information. You are currently browsing the archives for the mosque category.